Der Mikael Der Kosrofian was born in 1965 Aleppo, Syria to Minas and Mary Minasian. At a very young age his grandmother would take him to Karasoun Manoog Church on a daily basis, sometimes staying there for hours. Although too young to recall everything, looking back now Der Hayr is able to see how God had started working in his life. He attended Hygazian Elementary School. Having lost his parents at an early age, Diran and his brother Levon were adopted by his Uncle Mikael and Aunt Mary Der Khosrofian, who saved them from the perils of the Middle East conflicts. He arrived in Whitinsville, Massachusetts January 12, 1975 at the age of nine and attended Northbridge Public Schools, graduating in 1985. He enlisted in the United States Army in 1984, serving in North Carolina, Germany, and Kentucky until being honorably discharged in 1992. He subsequently attended and graduated from the New England Institute of Technology in Rhode Island. 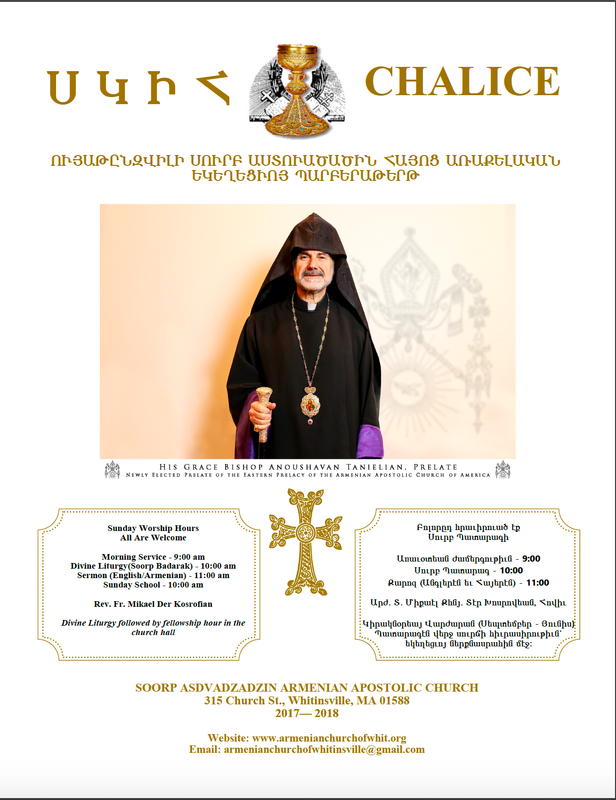 Since the age of ten, he has served Soorp Asdvadzadzin Armenian Apostolic Church of Whitinsville; as an altar server and as a member of the Board of Trustees. He was ordained an acolyte by Archbishop Mesrop Ashjian of blessed memory; a sub-deacon and deacon by His Eminence Archbishop Oshagan Choloyan. Feeling the power of Gods’ calling to serve our Creator, His children and the Armenian Church, Deacon Diran expressed his calling to Der Aram and Oshagan Srpazan. In the Spring of 2011, he began his studies for the priesthood with Deacon Harold Nazarian. Their teachers included His Grace Bishop Anoushavan Tanielian, Der Sarkis Aktavoukian, Der Antranig Baljian, Der Karekin Bedourian, Der Torkom Chorbajian, and Dr. Vazken Ghougasian. Der Mikael is married to Susana Seropyan Der Khosrofian; the two met in Holy Echmiadzin and are the proud parents of Mary, Molly, Yeva, Vahan, and Nune’. Der Hayr’s special interests include the education and preservation of Apostolic teachings and Holy Traditions which have been transmitted from generation to generation since the time of Christ.